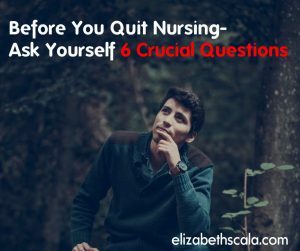 Did you know that one of the key words that brings people to my blog is “quit nursing”? I was actually shocked when I found this out. After the initial surprise wore off, I found myself feeling something else. For me, it is very disappointing to know that there are many nurses out there who want to quit nursing. And, I understand. The hours are long. Often so long, that we do not get paid to stay late and finish up our charting. The patients can tear us down. Literally. Ask any nurse if she or he has even been swung, spit, kicked, or cursed at. Sadly, I imagine that they have. The work is physical. And mental. Emotional. Spiritual. Energetically taxing. We give so much of ourselves to our job that when we get home, there is often not much left. Just the other day, I talked with a nurse who said that her feet are in so much pain that when she is home she has to ask her children to get her a glass of water because she just cannot get back up. OK, so you want out of the nursing profession? Well, before you go… I hope you will reconsider. And, I have a few questions to ask you that may help you think further about your decision. 1) Why did you become a nurse? Really. Have you thought about it lately? So many people decide that the job is not for them and that they want out before reminding themselves WHY they got into the nursing field in the first place. You would rather go work at a large box store than give care as a nurse? Now, I am not knocking the store Walmart. I am just painting a picture here for you. 2) What will you do if you do not do nursing? It is a legitimate question. Have you really thought this through? Now, if you want to quit nursing and I cannot change your mind, then that is well and good. But before you jump ship, this new job of yours… what is it going to be? How is the pay? What about the benefits? Do you get days off in the middle of the week? Will you work with a team? 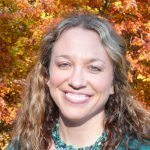 Is the environment fast-paced? Where will you find an interview? What will you apply to do? Really, before you decide to quit nursing, I would encourage you to have another plan ready. Do not just leave without having anything else in mind. 3) What is it that you LOVE about being a nurse? No, no. I am not trying to convince you to stay. Trust me, I would never do something like that. If you are that unhappy in nursing, then you are doing a disservice to the profession and the patients you care for. However, I do encourage you to think about what it is you DO enjoy about nursing. Why? Because maybe you will look for another job (even in nursing?) that allows you to do the things that you like to do. I would suggest listing out all of the things you DO like about being a nurse. Make that list first, before you turn in your resignation notice. 4) Can you find another nursing job? I have always said that this business I have here is not about taking nurses away from the bedside. Oh no. Even if I teach nurses business skills, it is to — USE in nursing. We NEED nurses in the profession of nursing. Good nurses who love nursing. So, instead of leaving altogether can you simply find another nursing job? Rather than quitting nursing, can you find something new to do? If so, what would that be? What kinds of things have you always dreamed of doing? Instead of running away from something… run towards it! 5) How will you feel when you’ve left? Wow, this one just gave me chills. It is a really interesting question. And maybe something that you cannot even think or feel into. But let’s just say you quit nursing. Now you are working at your local florist. How does that feel? Do you feel proud of yourself? 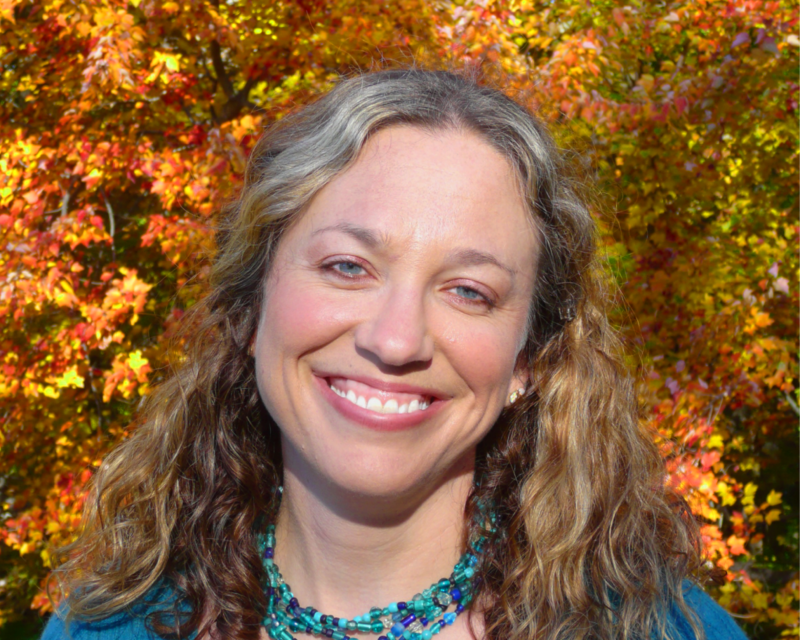 Do you miss talking with patients? Are you excited to go into work each day? If possible, I would suggest you see if you can figure out how it will feel to no longer be a nurse. I hear from SO many nurses that I interview on my podcast who tell me that nursing was their calling. That they knew they wanted to be a nurse their entire life. How do you think it would feel if you could no longer be a nurse? 6) Why do you want to leave? 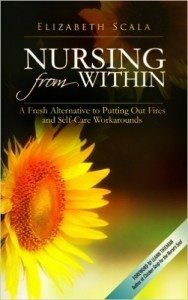 If you want to quit nursing, why? Is there a particular person that you cannot stand working with at your job? Is it the policies of your organization? Maybe it is something that you can change simply by finding another career as a nurse. Then you do not have to quit nursing altogether. You can simply make some changes to get out of your current job and into a new one that is more suited for you! Let’s hear from you! Have you ever wanted to quit nursing? If so, what did you do about it? What can you share with our readers to help them stay in the profession of nursing today? Thanks for reading and I look forward to hearing your thoughts below! This is very moving article. 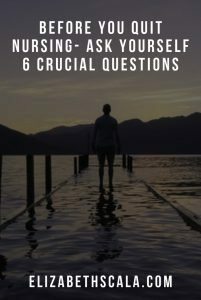 I am not a nurse but I am truly moved by the questions you have written. This is not just applicable for nurses who are thinking about quitting the career they choose and they love. We, at https://www.locumtenens.org/ are offering career options not just for nurses but also for other health care career will bear these questions and answer in our minds the moment we thin about giving up to what we have. Thanks for the feedback, and the resource. Great to hear you enjoyed the post! In México, a nurse pay is around $7000-$8000 pesos per month, that means no more than 5000 dollars in a year (sorry for my bad english, I’m learning) working six days in a week. I’m a nurse. The hospital where I work is one hour and a half by car from my home. But, obviously I don’t have a car so I take a bus and then the subway. I wake up at 4:30am If I want arrive at work 7:00am. When I go home, my feet hurts so much, but I need to cook, wash my scrubs, iron, clean (no money for washmachine or more than two scrubs, for now) and before I go to bed I study English by myself. I paid a quarter of my pay for it. I thought that being a nurse would be wonderful and I’d be so proud, and may be I’m proud but there’s no wonder or happiness. That’ why I start studied English, is my second plan. I have wanted to be a nurse since the age of three. I love caring for, teaching and helping to make patients whole again. It gives me great pleasure. There is no other profession where you can do so much for others than nursing. At the same time I am one of those nurses that have been called foul names, yelled at, grabbed, had sexual advances made and hit in the abdomen when seven months pregnant among other things. That didn’t deter me. I continued doing the profession that I loved. After forty-one years of doing what I loved most, my body finally said, “No more.” My back, legs, feet and neck were all extremely painful. I had spinal surgery and dozens of epidurals. I also recently had a new hip replaced. My BP was getting higher and higher and my meds continued to be adjusted. It was a very sad day when I had to leave my patients and co-workers. I still miss it greatly after two years. I hope to be able to volunteer some day doing some nursing duties and helping others. It’s part of me.